This Remington Noiseless Portable was the most impressive of the lot - much smaller than I had expected from pictures I've seen online, and it appeared very clean and well-looked after. 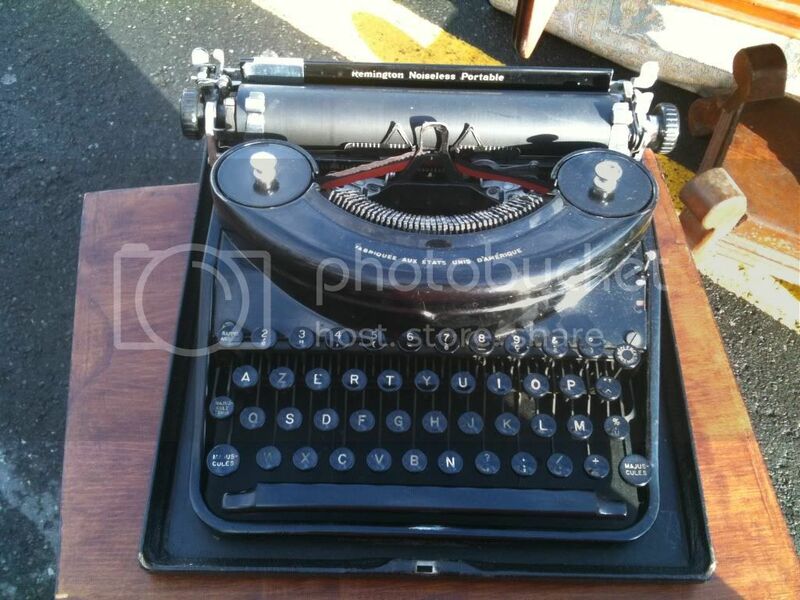 A definite temptation, if not for that AZERTY keyboard! The seller of this Mignon index typewriter was very proud of it indeed, and in fact printed out a sheet from a collector's website to illustrate how prized it is (the laminated sheet was being read by a prospective customer when I took this photo). I believe he was asking about $500! 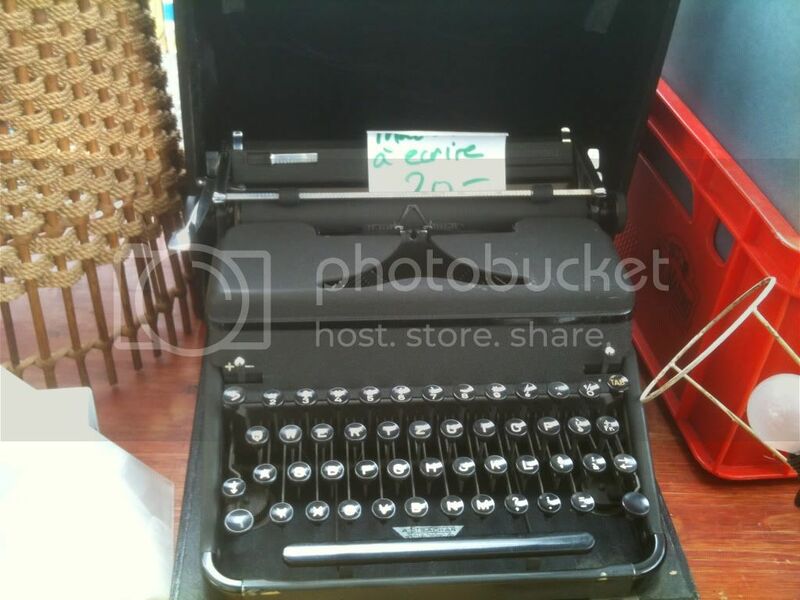 A Hermes Media typewriter being offered for $20. This Royal is from a bit earlier in the year, when there was still snow on the ground. A rather huge standard machine! Not very common around these parts, though. 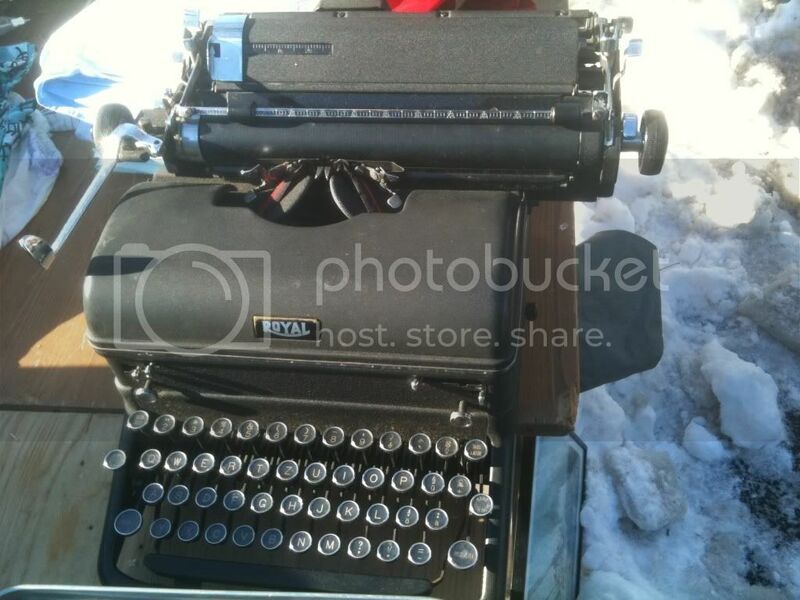 Thanks to Deek, February has been declared Typewriter Appreciation Month! As I cannot very well organize a one-person type-in, I shall observe it by sending typewritten letters to fellow typosphere-dwellers. I have heard tell of a writing circle around these parts - how do I join? Do I write letters to everyone in the circle first, or do some people write first and surprise me (hint, hint)? I would be very glad for some clarification on the concept, which I think is an excellent idea, and I look forward to joining in the fun. Time to stock up on some pretty Swiss stamps! As you can see, it's in excellent cosmetic condition - nothing to indicate that it had ever been dropped (if that indeed is the case). Both carriage knobs are intact, there is not a dent or a scratch anywhere, nothing askew except for a bent tang of iron inside that holds a screw which in turn aligns the carriage properly. Up close and personal with the epoca typeface. There's a tiny bit of ink crud but not enough to hinder typing - this was really quite clean, if not functional (at least for a while!) right out of the box. Despite having complained in my last post about losing the green metal cover of the feed rollers (which we might try to replace as soon if we locate springs that fit), I really don't notice that it's not there while I'm using the machine, or even in general, since that part is well-hidden by the ribbon cover in any case. I would imagine this brochure was released by Paillard in 1958, the year that the curvy Hermes 3000 was first introduced, to tout its benefits to potential buyers. We found this with the documentation for a Hermes Media 3, which is basically the 3000 without the red margin indicators. This is actually a one-sheet foldout, and when folded it is half this size lengthwise. So what we are actually seeing here is the front and back page: the front page showing how closely the machine fit into the clamshell-style case, and the back page showing how it is so light it can easily be hoisted up by a wasp-waisted secretary. Hmm. Don't know about that. A couple of pages in the foldout are designed to be read together, as seen above. The brochure is in French, and the machine pictured actually has a keyboard with a Swiss-French layout. This tells us that Hermes is revolutionizing the "large portable" industry by introducing the most complete portable in its 20 years of operations. The colorful arrows tout some of these revolutionary features, including visible margins in front of the paper, an integrated base, and the three-position ribbon switch that prolongs the life of the ribbon. Right in the center, a beautiful picture of the Hermes 3000. The last couple of pages are not as easy to scan together because it's on opposite sides of the same section, so here we go. More elaboration on the advantages of the 3000, together with an annotated diagram. Finally, this last page shows a diagram of what happens when you type, and also assures buyers that the 3000 facilitates easy maintenance by making it simple to reach the inner workings of the machine just by taking off the carriage (I haven't tried it, though). The Swiss have fed off the reputation of their watch industry for centuries, and so the closing words of this brochure are: "As accurate and reliable as a Swiss chronometer." Not sure if this was zoomed in, just to be on the safe side, but she didn't seem bothered either way. Surprisingly calm in the face of all those flies; I don't know how they do it. The cow bells in Switzerland are called "Trychel", and miniature replicas are to be found in every well-appointed souvenir store. You can never have too much cowbell! All the talk of Olivetti in the comments of my last post had me reading up on the history of Olivetti SpA today - as the only typewriter manufacturer that has managed to evolve successfully and is still in operation in the twenty-first century, selling telecommunications and printing equipment, I wanted to find out how they did it. After a few minutes, my eyes glazed over reading about the various crises, mergers and acquisitions, but I unearthed one fascinating nugget of information: the company was plunged into peril when Adriano Olivetti (son of founder Camillo Olivetti), who led the company in the 30s, 40s and 50s, died suddenly in 1960 during a train ride from Milan, Italy to Lausanne, Switzerland. I also learned that the Lettera 22 typewriter was first introduced in 1950, during Adriano's tenure. In 1959, coincidentally in the year that Olivetti acquired Underwood, the Lettera 22 was named by an international jury of designers as the best of 100 products in the previous 100 years. The late 40s and 50s under Adriano's leadership were the golden days for Olivetti, with very successful products such as this portable typewriter, the Lexikon 80 standard typewriter, and the Divisumma 24 calculator. 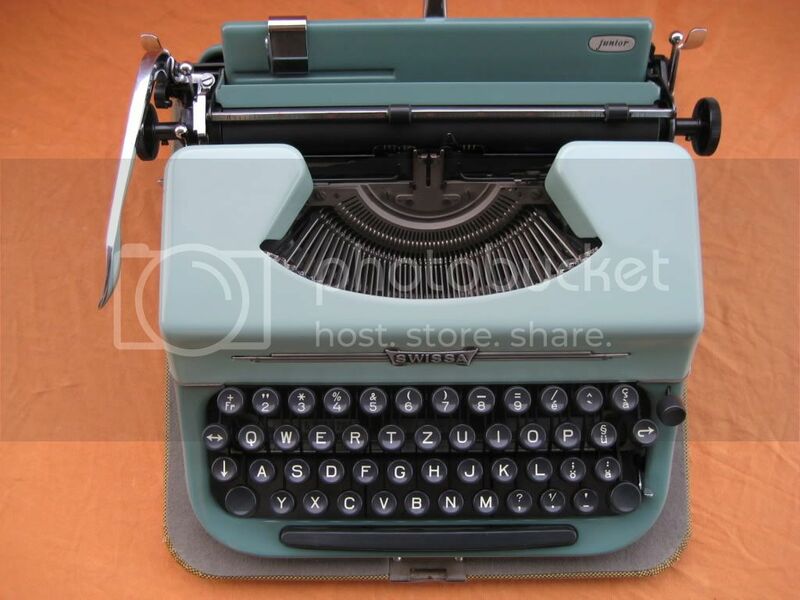 The Lettera 22 differs only slightly from the subsequent and much more widespread Lettera 32, which was offered primarily in a turquoise color, with a boxier build and square keys. What we have here, as you may have noticed, is labeled Pluma 22, but it is the exact same as the Lettera 22. It was built in Spain by the Olivetti plant in Barcelona sometime in the early fifties (hence the absence of the red tab key, which had not yet been added). Hispano Olivetti indicates its Spanish origins, as does the keyboard which contains the upside-down question mark and the N with a tilda. 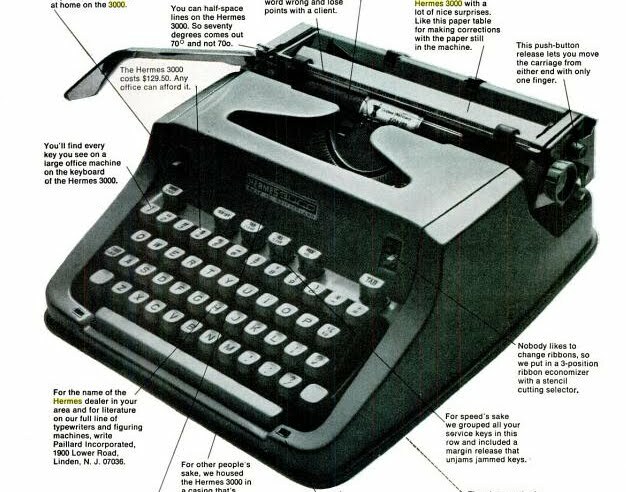 After making this thorough list, the only typewriter that qualified was a Lettera 22 - specifically the Spanish-made Hispano Olivetti Pluma 22. But where could we find one? There was one on offer from a seller on eBay Spain at the time, but it was pricey and shipping to Switzerland would cost almost as much as the machine itself. The auction was set to end on a Sunday, I think, but the day before, on a Saturday, I suggested we make an excursion to the flea market. Well, you can guess the rest. 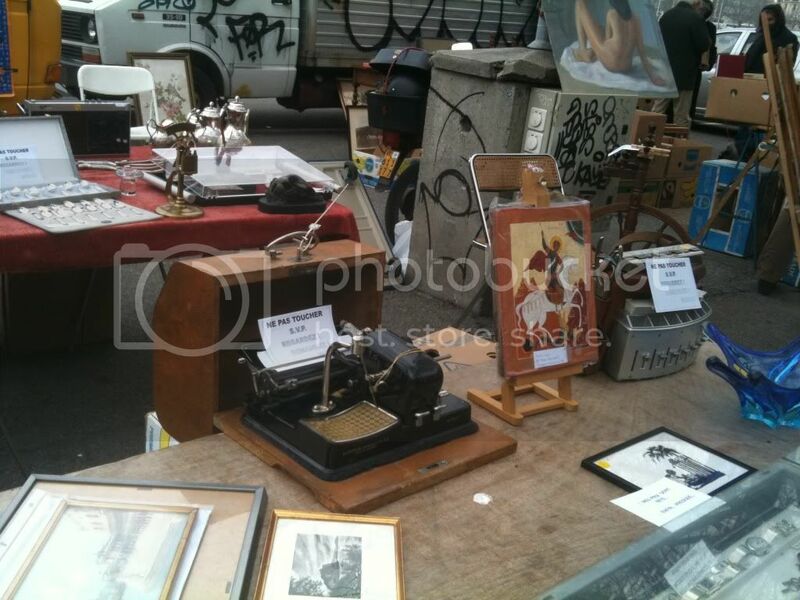 The flea market in Geneva has few portable typewriters, and when they do appear, they are mostly Hermes. It is rare enough to find an Olivetti portable - I have seen three in the past year - but to find a Spanish Pluma 22 on the exact same day that we were considering purchasing one from eBay? The stars lined up perfectly for this one. J pulled out his wallet as soon as we examined it and verified that it was indeed working and had the desired pica font, but I made a counteroffer anyway and the seller (despite an evil glare) gave us $5 off. Here is the case - a bit ragged, but both zippers work and the handles hold firmly. It also came with original Olivetti cleaning brushes, the manual, and a soft vinyl typewriter cover. This was definitely one of our more memorable finds; it's great to come across something you've been looking for and finding it in person fosters a rather special connection as well. A bit ranty towards the end, but I've been mulling over this for a couple of days and wanted to post it up for your thoughts and reactions. I'm quite stingy about using new ribbons on my typewriters, although I have built up quite a stock of Pelikan brand spools over the past few months, ordered in bulk from various Swiss stationery suppliers. For one, I like to squeeze as much use as I can out of the ribbon that comes with a typewriter, unless it is practically transparent and thus unusable. Even then, I shall admit I have briefly flirted with the idea of spraying WD-40 on the ribbon to get some more use out of it, a tip I read on the PTF forum some time back. However, another reason I cling stubbornly to the old ribbons is that they are better quality: some of the brand new nylon ribbons are quite greasy and smudge all over the place (thanks for nothing, Pelikan), and the flimsy plastic spools do not inspire much confidence. I find it rather elegant to be able to fit a stately '50s typewriter with metal spools, and fortunately we have harvested enough empty ones that we can transfer the ribbon onto sturdier spools if desired (or necessary due to different sizes or ribbon posts). 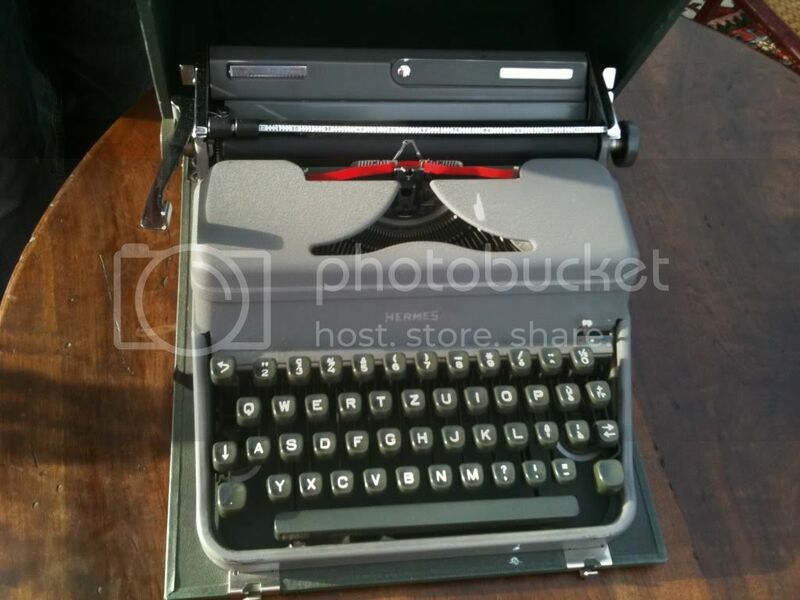 The Kores box pictured above is an eBay find from a few weeks back - there I was, browsing through the auctions, just checking out one thing or the other, and this auction for "new old stock" purple typewriter ribbon leapt out at me. I have a fondness for colored (i.e. non-black) typewriter ribbon, which has proven impossible to find locally, and doesn't seem to be manufactured anymore in Europe. This came from France, and there were four sealed ribbons remaining (out of a box that originally contained six). Each canister contains one metal spool with the ribbon wound around it, and the typist has to provide their own second spool. Inside the plastic box, the ribbons are sealed up with gold foil. It was my first time opening up a new cotton ribbon, and perhaps it was because this one had several decades to properly soak into the fabric, but there was none of that smudgy greasiness that I have noticed with new nylon ribbons. I installed it on the Swissa typewriter I showed last week, and you can see it in action here and here. The ribbon typed beautifully right out of the box, and I look forward to using the others on my other typewriters - or, in a bid to be frugal, I might just transplant it from the Swissa. I've been trying to figure out just when this ribbon was made - what do you think? I'm guessing that since this was intended for Underwood typewriters, it might date from before the Underwood-Olivetti merger, thus late '50s or so? That seems rather old to have relatively contemporary packaging (plastic boxes in cardboard box instead of single metal boxes), but then again I am not an expert on ribbon boxes in general. Getting this was a nice change from the usual typewriter acquisitions, and I shall keep an eye out for more "new old stock" on eBay from time to time... I am especially keen on finding blue and green ribbons as well. From this brief and highly unscientific test, my conclusion is that cotton > nylon. To save some time and avoid repetition, I am reproducing here the pages of the manual that show the Hermes 2000 pictured. Other mundane instructions, such as how to change the ribbon/ use the space bar will be omitted as they are virtually identical for every typewriter. Like the Triumph Tippa manual I shared earlier, the manual for the Hermes 2000 is also in the form of a pamphlet. 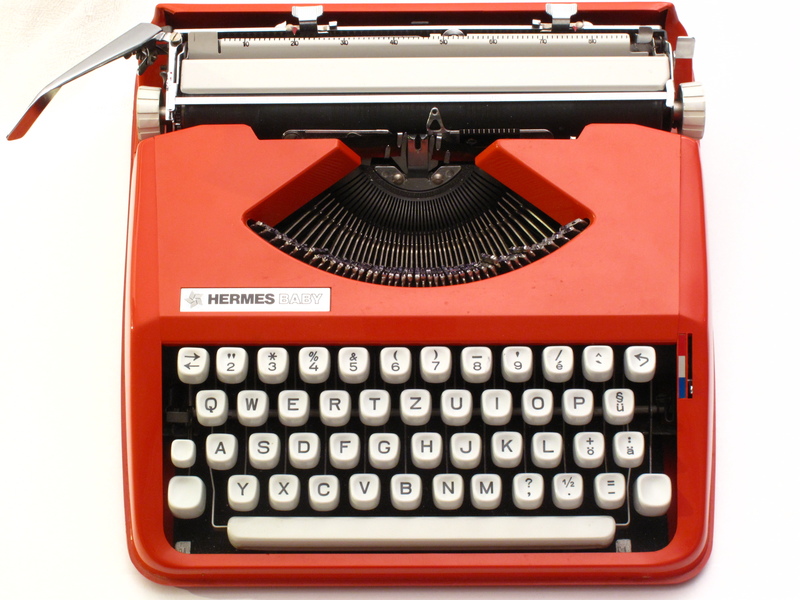 The front cover, shown above, reproduces the Hermes 2000 logo that is not used on the typewriter above, but appears on this one. The second page goes on at great length about closing and opening the handsome leatherette case that came with the later versions of the Hermes 2000, as well as unlocking the machine for the first time after it leaves the factory. Here, we get detailed instructions on how to feed in the paper. Now, this is interesting - I've never actually tried to make columns and draw lines with my typewriter, but I suppose it's comforting to know I could do so if I needed to. The "flying margins" that would later appear on the Hermes 3000 with red ribbon indicators are also present on the Hermes 2000 in an earlier version. Using the margins is just as complicated, like tying your shoelaces in the dark. This page also shows the tabulator (oops, all this time I thought it was a touch control regulator), and presents a list of the type styles that were available when this was printed: Economic, Diamant, Elite, Hermes Special, Pica, Large Pica, and Medium Roman. 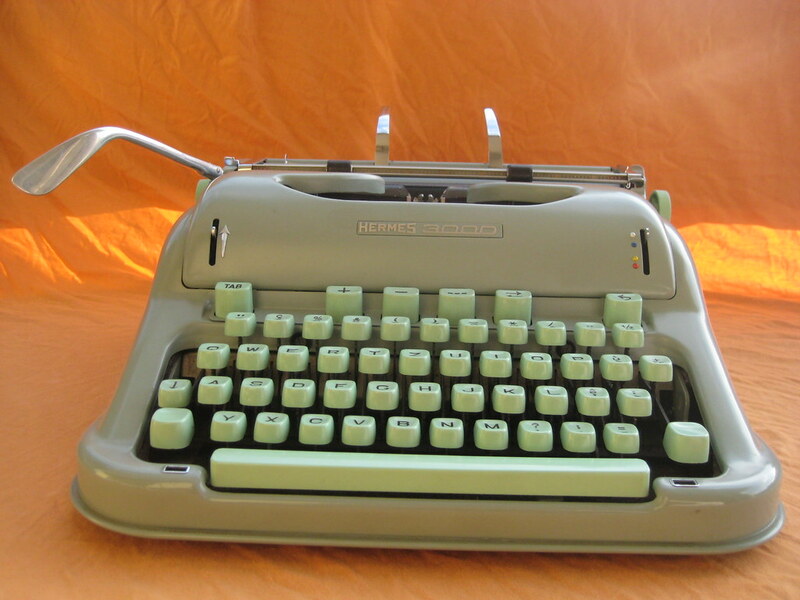 In terms of color, the Hermes 2000 seems to have been available in green only, and the Hermes Baby in gray only. A labeled diagram of the machine (with ribbon cover removed) folds out from the last page of the instruction manual. Parts named - in case you ever wanted to know what to call the various typewriter parts in French! Back page - don't forget to call your agent for a demonstration! 70 keyboard layouts available for all countries!